[SatNews] Lockheed Martin [NYSE: LMT] Space Systems Company has started their hosting of 26 middle school, high school and junior college teachers for an eight-week summer fellowship program. 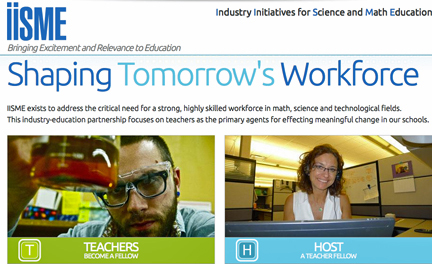 The teachers are part of the Bay Area-based Industry Initiatives for Science and Math Education (IISME), a nonprofit industry-education partnership that provides unique professional development for teachers. IISME’s industry-education partnership focuses on teachers as the primary agents for achieving meaningful change in education and encouraging and inspiring students to pursue science, technology, engineering and math (STEM) fields. This year, IISME celebrates its 30-year anniversary and a 30-year partnership with Lockheed Martin. During this three-decade partnership, Lockheed Martin has provided hands-on teacher fellowships to 400 Bay Area teachers. During the summer, each participating teacher or IISME Fellow is paired with a Lockheed Martin employee-mentor who has prepared an engaging STEM-related job assignment. IISME Fellows focus on a broad range of technical challenges under development in the Sunnyvale and Palo Alto facilities related to satellite and missile advanced technologies. The industry experience helps teachers stimulate student interest in math and science using real-world examples to engage students. Lockheed Martin directly reaches members of the future workforce through one-on-one contact with teachers. Considering the number of students that teachers influence throughout their careers, the IISME sponsorship helps math and science teachers build a robust pipeline of science and engineering talent. IISME was founded in 1985 by a consortium of San Francisco Bay Area companies including Lockheed Martin, in partnership with the Lawrence Hall of Science at the University of California at Berkeley.